It is looking more and more like a power struggle. The relation between journalists and police in Iraqi Kurdistan is a difficult one. After hundreds of incidents involving journalists in the two last years, the main question is now: how to keep journalists safe. 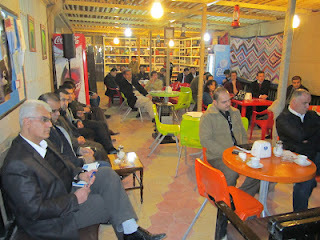 The reasons for the incidents are many, as we discussed with Kurdish editors in chief in Sulaymaniya, on February 15, 2012. It is because some journalists feel part of the political system, and don't realise their role as informer to people about what is happening in their country. They do not realise their power is in providing information, in a fair and unbiased way, so people can make their own choices. Journalists in Kurdistan often are activists. In their work, but also on the street. In some cases journalists are known to have thrown stones and shout slogans. And then they stopped being member of the press and became an individual, as one of the participants in the meeting said. For the police, there was no difference between them or other demonstrators. I was sad that some journalists I respect very much, last year decided to become part of the protest movement by holding speeches. That is not your job, I have tried to tell them, and it makes you seem to be with the demonstrators. Again, that is how the police saw them. Part of the problem lies with the fractures inside the Kurdish press. Many journalists work for party media, so they are aware of the policy of their party, and of their role in the media that gives people only the information the party thinks is fit to read. Or - to make it more complicated - what they feel the party thinks is fit. Many party journalists censor themselves, while the party would allow much more than they think. The other group is made up of independent journalists, and journalists working with the opposition parties. For outsiders, they are seen as equal. They are all against the government, they write against it and in some cases act against it. It is a long way to make the change here. But we can start by making journalists understand their role during demonstrations. I was joined by a number of respected Kurdish journalists and opinion makers when I asked editors in chief to instruct their staff on how to behave during demonstrations. Keep out, do not mingle with the protesters, report from the side lines, and make yourself visible by wearing a special PRESS vest. Be visible and stay safe. We presented the editors in chief with special orange vests with the word PRESS on them. Some participants in the meeting called this naive. As if the police would act differently when confronted with journalists in orange vests. They said it would even be dangerous, as journalists would be more recognisable - that would make it only easier to attack, harass and arrest them. Partly true, we found. The meeting was held in anticipation of the remembrance of the bloody unrest of February 17, 2011. Everybody was expecting new protests, a year after the start of the demonstrations that cost a number of lives and lasted for months. The police too. They were out in force to prevent protesters to take to the streets. And when hardly any came out, they started harassing and arresting the photographers who dared to take pictures of the situation. Amongst those arrested was (in the picture) Rahman Garib of the Metro Centre to Defend Journalists - in the very first orange vest I presented him with during the meeting. He is a photographer too, and was doing his job. In total around ten reporters were picked up, most of them were released a couple of hours later, some after being threatened severely. Why? These journalists were doing their job. 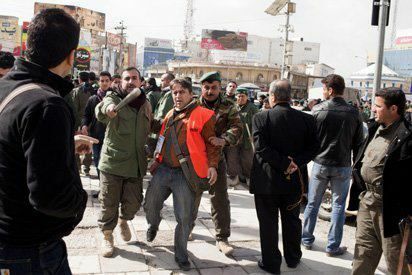 There is no law in Kurdistan that prohibits reporters from taking photographs during demonstrations. The Press Law says that journalists have the right to collect information. Well, some do it by writing, some by filming, some by taking photographs. I try to get this message across to young officers in security police - those that are out on the streets during demonstrations. In my lectures I try to get them to understand that police and journalists are both serving the people. That it is their responsibility too to make sure journalists can.But they receive different instructions from their bosses, who still consider journalists as the enemy. Who think that in this day and age of internet you can still avoid that pictures are taken during demonstrations - which are important moments in a democracy when people speak out and should be heard. These bosses get their ideas from the parties they are member of, or from politicians they are close to. Therefore journalists in Kurdistan will only be safe and able to do their work, when politicians speak out for them. When the new government, that is formed in the next weeks, defends the rights of the press and openly supports measures to improve press freedom and prevent censorship. When it supports the idea that journalists that make themselves visible as such during demonstrations and play their role as reporter without becoming involved, will be allowed to do their work. I will be knocking on a lot of doors in the coming weeks to get this message across. But right now I knock on one door in particular: the door of the returning Kurdish Prime Minister Nechirvan Barzani, who is forming his cabinet at the moment. I have heard him declare support for the press more than once, saying that without free (international) press the Kurds would have been lost in 1991, and that for that reason he supports an independent press in Kurdistan. Mr Prime Minister, show us you meant it. Help us to keep the journalists in Kurdistan safe. Stop police harassing them, and beating them up. Join us in our campaign to improve the situation of the press in Kurdistan. It will enhance your name, in and outside of Kurdistan, where the criticism about the harsh treatment of the press is growing. 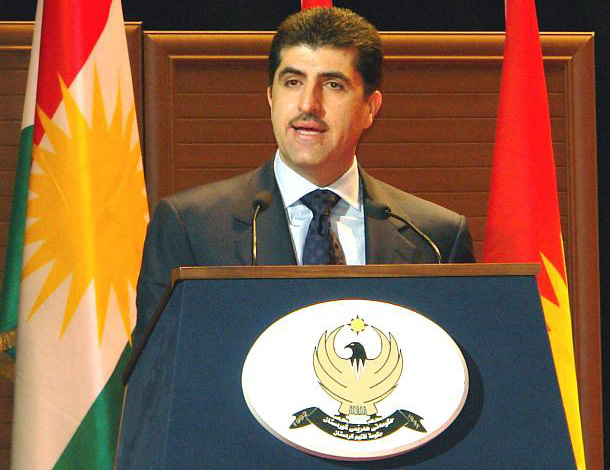 But most importantly, it will help to give Kurdistan the press that it needs, and deserves. A responsible press that works for the Kurdish people.